There’s a common grievance that Chicago is a desert of contemporary art collecting, but I’ve always been skeptical of that perspective, as it’s a little too simplistic and predictable to constantly pine over, and be disappointed by, the lack of wham-bam-thank-you-ma’am class of dealers and buyers here. An alternative exists. Private collecting is not always about purchasing major paintings for mansion walls. Smaller stuff, like handmade books and drawings, are easier to collect, and not-so-obvious items, such as correspondence, snapshots, clippings and scrapbooks—what is usually termed “ephemera”—when combined provide a thrillingly unique approach to an artist’s life. Imagine that after you die your shoeboxes full of letters, your sketchbooks and junk drawers are preserved in total, as an archive, to better understand how you lived, worked and related to your community. Your souvenirs would be evidence of your life. No one wants to simply disappear. Two current exhibitions reveal why archives matter. 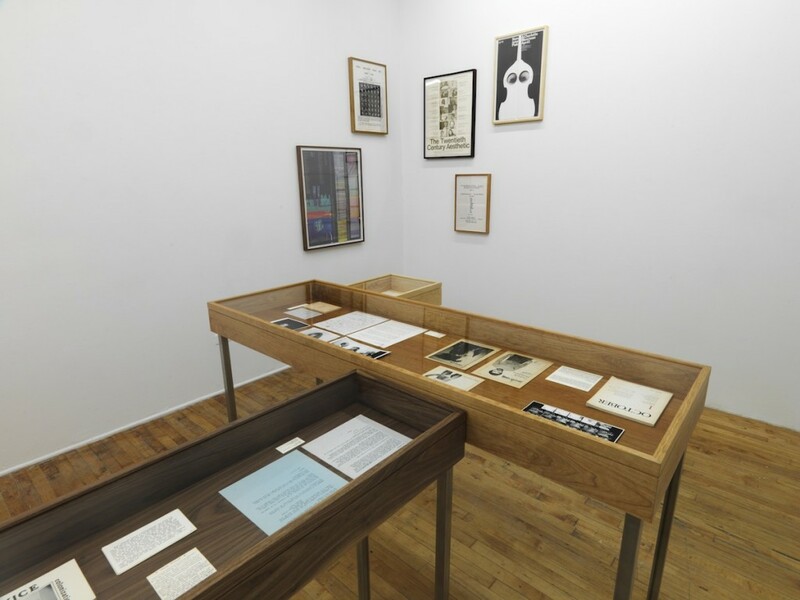 At Rowley Kennerk Gallery, artist Joseph Grigely shows in six vitrines the residue of critic and artist Gregory Battcock’s life (1937-80), and at the newly opened Public Collectors Study Center, artist Marc Fischer shows eleven artist books by Don Celender (1931-2005). Although both Battcock and Celender had a presence in the New York art scene, and both sought to have lasting importance on the cultural life of American art (each earned a PhD and published regularly), their legacies are scattered and buried, just waiting for the right person to pick up the pieces. In the early nineties, Grigely had a studio in Jersey City in a warehouse shared with a storage company that eventually moved out, leaving behind boxes of delinquent clients’ goods. 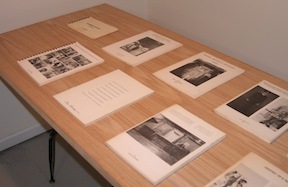 He came across items from Ron Whyte, whose name he did not recognize, and within that, objects and ephemera from Gregory Battcock, an editor, artist and critic. “What emerged from the papers that littered the floor of 111 First Street was evidence that Battcock was a complex person,” writes Grigely. Ron Whyte, the executor of Battcock’s estate, died in 1989, leaving the critic’s papers in a state of limbo, some later donated to the Smithsonian by friends but the rest were left for Grigely to stumble upon. Grigely also donated much of his find to the Smithsonian, but kept about ten-percent of it, some of which now makes an appearance in Rowley Kennerk’s gallery, where viewers can reconstruct the details of Battcock’s public and private life. Marc Fischer’s story of discovery, of Don Celender’s books, is similarly fortuitous. Like Grigely, Fischer had been aware of his subject’s output, perhaps tangentially or informally, until he came across a collection of works for sale, for dirt cheap, on eBay. Celender, who was based in St. Paul, Minnesota and taught art history there, frequently exhibited his conceptual art books at OK Harris Gallery, in New York. Eleven of these books, some browning at the edges, are compiled in Fischer’s Study Center, in his quiet basement bedroom, for viewers to peruse. Possibly no other opportunity currently exists to become so familiar and intimate with Celender’s artistic output. Walking into Grigely’s installation of Battcock’s life feels a little like a conceptual art piece itself, as if it were one of those fictional artistic personas conceived to critique identity itself. But it is not. Viewers may not flip through the manuscripts and letters contained beneath glass in the vitrines, but some gems rise out of the cases, like a quick drawing of a man being anally fisted, on a college’s letterhead, and nuggets of Battcock’s wisdom from unpublished manuscripts. It is a little like detective work. Gallery proprietor Kennerk pointed out the blurry face of a man in a photo of a Charlotte Moorman performance who may or may not be Robert Smithson. Such discoveries are like detective work, and could well aid research into that artistic milieu. One of Battcock’s major projects was to integrate art criticism with art. Likewise, Grigely wears several hats, as educator, artist and historian, even taking ephemera from his own life, such as written conversations (Grigely is deaf) as his art. It is one of those serendipitous moments where we learn about the collector and his collection in the same breath. Marc Fischer’s collection is also a personal commitment. He is a member of Temporary Services, a group that seeks to bring art into peoples’ lives, holding events outside of the usual art gallery environment. Fischer’s Public Collectors turns private collections inside out, inviting viewers to enter private spaces and learn about under-exposed lives. There are no gallery openings at the Study Center. It is rather a contemplative space for personal knowledge, and Fischer is glad to share his resources. I asked Fischer if he was interested in donating his collection to a public institution, where the possibilities of public access could be even greater than in his home. He had clearly considered this before, and feels more comfortable holding on to his collection, and sharing it with visitors himself.